Cloud was admitted to the Medina Raptor Center in December 2005 as a young adult after he had been hit by a freight train in Cleveland. He had sustained severe head trauma and injury to his left radius/ulna that required part of his wing to be amputated. These injuries not only left him unable to fly but also impaired his vision. 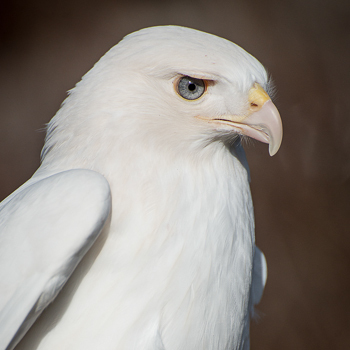 He is also leucistic, a genetic variation where pigment is produced by the animal, but does not deposit on the feathers. He now resides at the Medina Raptor Center as a unique ambassador to his species.